Theresa May went head-to-head with Jeremy Corbyn in the House of Commons. Here’s what happened. This was an extraordinary session, dominated by the mass walkout of the SNP’s MPs. You can read all about that here. That rather took the spotlight off what was meant to be the main event. For the second week running, Jeremy Corbyn focused his firepower on the government’s handling of Brexit, mining the rich seam of material offered to him by Boris Johnson’s leaked remarks to a private dinner. Why didn’t Mrs May take the foreign secretary’s advice and ask Donald Trump to take over Brexit negotiations, he asked. The PM was initially unable to answer as she was drowned out by the noise of MPs. Speaker Bercow reprimanded Brexit Secretary David Davis, saying: “you must recover your composure”. Mrs May eventually managed to get her reply in – a swipe at Labour’s position. MPs then fell silent as she made a detour to talk about the first anniversary of the Grenfell Tower fire – a subject raised by Mr Corbyn at the start of his question. She said all of the 203 families left homeless by the tragedy had been offered new permanent or temporary accommodation and 183 had accepted an offer of a permanent home. She then paid tribute to the “dignity and strength” the victims of the fire had shown. Mr Corbyn also paid tribute to the families – but said the “reality” was that some of them still did not have homes. Turning back to Brexit, he asked whether the transition period would go on until December 2021. The PM guessed he was talking about the “backstop”. She gave him a lecture on what the backstop is and why the government does not expect it ever to be used. “I am not really sure whether it is a backstop or a backslide she is taking about here,” said Mr Corbyn. He then asked – as he had done last week – when the government’s Brexit white paper was going to be published. “Where is it?” bayed opposition MPs. “Just calm down,” the PM told them, it would be published after the June EU summit, she said. But Cabinet Office minister David Lidington had told the BBC it would be published in July, said Mr Corbyn. She then took a swipe at Labour “divisions” and a guide to deselecting Labour MPs which had reportedly been posted on the internet by activists. “You have got to face facts – there may well be a meltdown,” said Mr Corbyn. 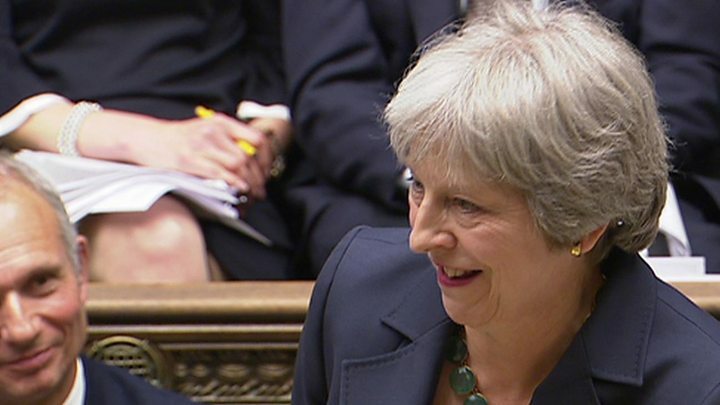 A gleeful Mrs May pointed a finger at the Labour benches. No, explained the Labour leader, these were not his words but the words of Boris Johnson at that private dinner. Another smile from Mr Johnson. The foreign secretary appeared to want “more friction and more disruption to the economy” as a result of Brexit, he claimed. Mrs May replied with a list of Labour’s shifting positions on Brexit, claiming that only her party could deliver the “will of the British people”. Her party was so divided on Brexit they were even whispering about her behind her back at Prime Minister’s Questions, said Mr Corbyn. Media captionTheresa May jokes about the name of the headline act at Labour’s summer music festival. It was the Labour Party that was trying to “frustrate” Brexit, said Mrs May. She threw in an attack on the last Labour government’s record on employment before unveiling her big joke. Labour had organised a music festival, Labour Live, she told MPs – “I will pass over the fact that it is going to have a solidarity tent, which obviously won’t have any Labour MPs” – but the two headlining acts were “the shadow chancellor and the Magic Numbers”. “That just about sums them up,” she said. 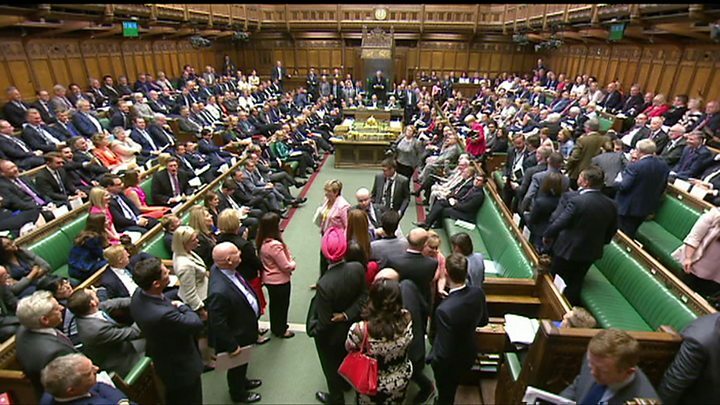 The SNP’s leader at Westminster Ian Blackford pulled what is known in the trade as an “I spy strangers move” in protest at what he said was a “power grab” during last night’s debate on the EU Withdrawal Bill. Mr Blackford demanded a vote on holding an emergency debate on Brexit and devolution after, he said, the SNP had been denied a voice on the matter in Tuesday’s debate. Mrs May refused and said Brexit would give more power to Holyrood and, in any case, it was Labour that was to blame for the procedural manoeuvrings on Tuesday night. The SNP eventually walked out en masse, leaving a large gap in the order paper, which had five SNP MPs lined up to ask the PM a question. Tory MP Luke Hall, the first to be called after the debacle, said the mass walkout reminded him of one of his after dinner speeches. Jacob Rees-Mogg gave Mrs May a sharp reminder of the Brexiteers’ demands for the government not to be over-ruled by Parliament on Brexit, following Mrs May’s concessions on a “meaningful vote” that enabled her to avoid debate in Tuesday’s Withdrawal Bill vote. Phew! 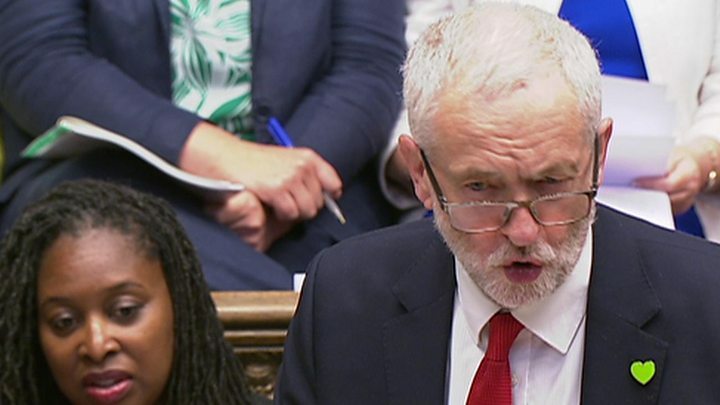 First a really lively set of exchanges between Jeremy Corbyn and Theresa May, then an orchestrated display of SNP fury, culminating in a walkout. 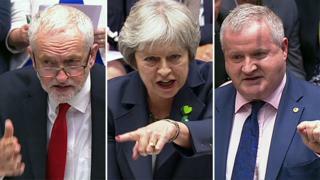 The exchanges between the leaders had a rare level of personal needle – and the stare the PM gave Jeremy Corbyn, when he taunted her with the leaked comments made by Boris Johnson, suggested he had scored a direct hit. And he then continued with the simple tactic of quoting the Foreign Secretary’s words against his boss. Neither of his targets enjoyed the experience. Given the government’s current Brexit disarray, he had an open goal before him, but he’s missed before – and this time the ball thundered into the back of the net. Then came Ian Blackford. His protest, attempt to force a vote, and subsequent walkout may all be mocked in Westminster, but they may play differently with Scottish voters. I’m old enough to remember Nick Clegg making a protest in 2008, about the treatment of the then third party, the Lib Dems, (ironically on an amendment calling for an EU referendum) and briefly discomforting Speaker Martin. His frontbencher Ed Davey was ordered out of the chamber, and Mr Clegg then led a walkout – calling the Speaker’s ruling a “constitutional outrage”. Third parties traditionally find the way the Commons works, which is carved up between the government and the main opposition party, intensely frustrating. The SNP are good at using Westminster for clever, social media-savvy political theatre – perhaps because they don’t hold it in quite the same reverence as the other parties; remember them whistling “Ode to Joy” during a division on the EU (Withdrawal) Bill? I would not be surprised if they try to generate a few more YouTube moments. The other issue that might worry the PM is the trains. Both Conservative Nadine Dorries and Labour’s Jeff Smith raised it – and while Brexit dominates Westminster, many MPs will return to their constituencies at the weekend, to find their voters fulminating about packed or cancelled trains. Oh, and for the first time, PMQs breached the 1pm mark; it had to happen, I suppose.